Next select if you want to use Live data or Locked data. Live data means whoever sees your widget will see it with current data. Locked fixes the date of the data to the time you embed the widget so whenever anyone sees your widget they’ll see the results as of the time you embedded it. What does this mean? You might want to use Locked data if you are writing a post about a point in time. i.e. tweets we’re positive in support of Obama’s support for marriage equality. 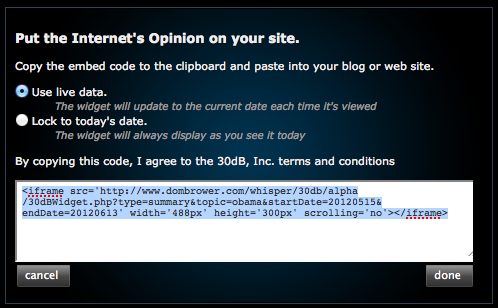 You might want to use Live data if you’re writing a post providing a portal into current events, i.e. enabling people to see how Bill O’Reilly and Bill Maher are stacking up against one another. The last few steps are things you do every day on your computer. 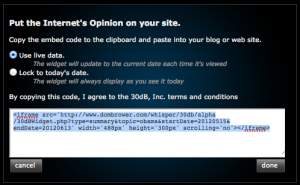 All you need to do then is highlight the embed code, use the copy function on your computer then paste it on any site, blog or presence online that accepts widgets – which is most places. That’s it. You’re done. We are aware that not every blog or site will allow widgets embedded today. Some of you will know how to work around your site to make this happen but for the rest of us mere mortals rest assured we’re working towards making the embedding of 30dB widgets as ubiquitous as embedding YouTube widgets. If you’re stuck you can always share the results as a link or linked static image via the Share feature on the widget.